The Annie Oakley TV series was a 30 minute western action show that aired in syndication. It was about a young woman who was 5 feet 2 inches tall and weighed only 95 pounds. Her small size was very deceptive, however. Unlike most women of her day, she didn't get married, cook, clean and bear children. Annie could shoot, rope and ride with the best of 'em! Annie Oakley, her little brother Tagg and Sheriff Craig kept their little town of Diablo safe from wandering outlaws. Annie was a women's libber about 70 years ahead of time. Nan Leslie ........ Alias "Annie Oakley"
Gene Autry, the western superstar of the time, produced this Annie Oakley series. He personally "discovered" Gail Davis (Annie Oakley) and featured her in nearly 20 of his movies and 30 of the episodes on his own TV show. Gail Davis was an excellent rider and trick-shooter in real life. 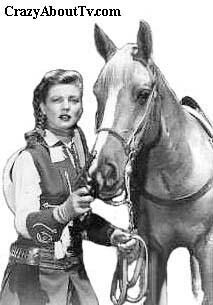 She actually performed in Gene Autry's travelling rodeo show. She absolutely loved the role of Annie Oakley and once said, "So far as I'm concerned, I'm going to be Annie Oakley for the rest of my born days!" The real Annie Oakley lived from 1859 to 1926. She gained worldwide fame as a sharpshooter in Buffalo Bills travelling shows. At the young age of 8, Shelley Fabares played Trudy Warren on Annie Oakley. Since she started as a children's clothing model at age 3, she had a whole 5 years experience in show biz by then! She's probably better known today for her roles on the "Donna Reed Show (1958)" or "Coach (1989)". Or maybe you've heard her singing her 1962 #1 hit song, "Johnny Angel". In "the olden days", theaters would give free tickets to the cast of a play for friends, relatives, etc. A hole would be punched in those tickets so that they were not counted as "paid for" tickets when the theater manager compared the days receipts with the number of tickets taken in. The real-life Annie Oakley used to shoot holes in playing cards from a distance as part of her act. Due to the similarity in appearance, the free tickets became known as "Annie Oakleys" and later was shortened to simply "Annies". Fess Parker wasn't as young as Shelley at age 29 when Annie Oakley began but he was in the first few years of his career. He got the role of "Davy Crockett, in a 1954 Disney film too. That role was great experience for his, probably, best-known role as "Daniel Boone" on the 1964 TV show of the same name. Gail Davis was born with the name, "Betty Jeanne Grayson. There was a 1935 movies titled, "Annie Oakley". It starred Barbara Stanwyck in her very first western role! "Bull's-eye! Annie Oakley hits the entertainment bull's-eye every week with her hard riding ... straight shooting ... and suspense." Thank you for visiting our Annie Oakley TV Series page!